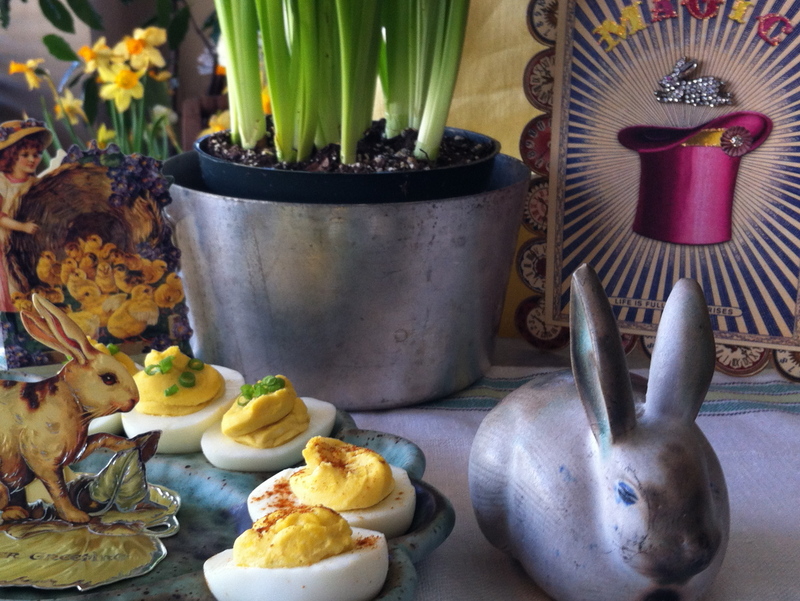 RICK ELLIS’S STUFFED EGGS FOR EASTER | Jane Lear. Writing on Food and Travel. I wrote about deviled chicken just a couple of weeks ago, but never mind: There is no better hors d’oeuvre for Easter or other springtime celebration than deviled, or stuffed, eggs. I am exceedingly fond of them, especially those made by our good friend Rick Ellis. A food stylist and culinary historian who crafted the sumptuous meals in Martin Scorcese’s adaptation of Edith Wharton’s The Age of Innocence, Rick’s style of entertaining at home is simple, honest, and direct. And he is never afraid to serve his stuffed eggs to the fanciest guests because he knows they’ll be the first thing to disappear. What gives Rick’s eggs their satisfying richness is butter. He got the idea as a teenager, when he saw Julia Child stuff eggs with an asparagus purée. “She put butter in with the yolks,” he said, and by the time the two of us met in the early 1980s, his version of green eggs and ham was party-perfect. Julia Reed first wrote about Rick’s “fame-maker” eggs for the New York Times in 2002, although it took a deviled-egg recipe contest sponsored by the Southern Foodways Alliance two years later to get Rick to actually write up the recipe. I was thrilled when he took first prize (although a Nobel would not have out of place), and since then, recipes for deviled eggs made with butter have multiplied like Easter bunnies. One of the things a friendship with someone like Rick will teach you is that simplicity doesn’t necessarily mean ease of preparation but rather perfection and balance in a dish. That’s why it’s important to cook and peel the eggs* with care and push the tender yolks through a fine-mesh sieve rather than mash them with a fork or whiz them in a food processor. The sieve is what gives the filling its great body—it’s fluffy and velvetized all at once. Another trick Rick has up his sleeve has to do with the seasoning. If you make these eggs and then devour them immediately, they may taste overseasoned. “I always make the filling ahead and refrigerate it,” Rick explained. “Then I pipe it into the whites at the last minute.” He continued, “When something is chilled, the level of heat, the salt, the acidity, everything changes.” Rick also added a caveat about Dijon mustard; some brands are spicier than others, and, of course, freshness is a factor, too. That’s why he’s given a range for the mustard below. Rick usually garnishes his stuffed eggs with snipped chives for freshness, but a dusting of smoked Spanish paprika is very nice, too. And I wouldn’t say no to a smidgen of minced crisp bacon …. 1. Place the eggs in a pan large enough to hold them in 1 layer and cover with cold water. Partially cover the pot and bring to a full rolling boil. Turn off the heat, cover completely, and let the eggs sit 15 minutes. Drain and run under cold water until the eggs are completely cold (quick cooling helps prevent a nasty green layer from forming on the yolks). 2. Peel the eggs (under cold water if they prove difficult) and cut in half lengthwise. Remove the yolks and with a flexible silicone bowl scraper or spatula (or your fingers), rub the yolks through a fine-mesh sieve into a bowl. Add the mayo, 2 tablespoons mustard (or to taste), and butter and mix until smooth. Stir in the lemon juice, cayenne, and a generous amount of salt and white pepper. Refrigerate the filling and the whites separately up to 1 day. 3. Let the filling warm up at room temperature just enough to spoon or pipe into the egg white halves. (If piping, use a pastry bag fitted with a ½-inch tip or jury-rig one out of a plastic ziptop bag with a corner snipped off). Neatly spoon or pipe the filling into the egg white halves and sprinkle with chives. * The eggs shouldn’t be cooked at a vigorous boil; otherwise the yolks will be tough. Ease of peeling is related to pH—that is, acid/alkaline levels. Eggs that are a good week old (a given if you buy them at a supermarket) will be more alkaline, thus have a higher pH and, yep, be a cinch to peel. This is why adding vinegar to the water—one of the great enduring culinary myths—isn’t a good idea. And if you are good about planning ahead, do as cooking authority Shirley Corriher does and turn the (securely closed) egg carton on its side the night before hard-cooking the eggs; that way, the yolks will be well and truly centered in the whites. Posted: April 3rd, 2012 under cooking, people + places, recipes, spring. The award winning deviled eggs-delicious!